New evidence has shown that the renowned Mogao Caves, formerly believed to have been first inhabited in the 4th century, have a longer history that dates back to the Han Dynasty (206 BCE-220 CE). Ma De, a research fellow at the Dunhuang Research Academy, drew the conclusion based on remains from the Han era found at beacon towers near the later-built caves. 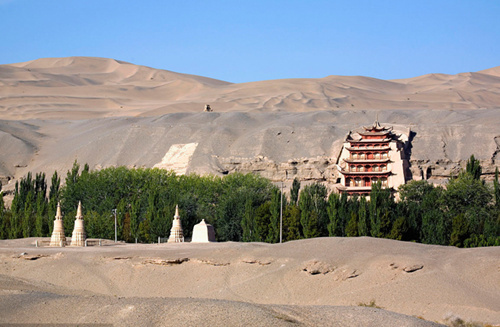 There is a prominent hill on a dune approximately 3 kilometers south of the Mogao Caves. On its peak stands a beacon tower from the Tang Dynasty (618-907). About 100 meters to the northeast, there is another beacon tower, which dates back to the Han Dynasty. The two beacon towers are like twins. It is hypothesized that the Tang beacon tower was rebuilt on the ruins of a previously existing Han tower. Because the location was named Dashapo, which literally means “big sandy slope,” the beacon tower site is known as the Shapodun Beacon Towers. Coincidentally, there is another pair of beacon towers at Hongshankou in Dunhuang. The two are situated in the vicinity of the Yangguan Pass in the Han Dynasty. The location was a major thoroughfare and strategic stronghold that played a significant historical role. The Shapodun Beacon Towers are only 500 meters away from Dangquan River, a long river in front of the Mogao Caves. Scholars said that Han soldiers who were garrisoned at the site to defend against hostile Xiongnu tribes probably lived in the river valley most of the time. The serene valley is home to such famed Buddhist sites as the Mogao Caves and Xianyan Monastery. After the Han government started to develop the Hexi Corridor and make defensive layouts to resist Xiongnu aggression, people began to carefully guard and utilize the Dangquan River area. The garrison troops at the beacon towers were, so to speak, the first pioneers in the history of the Mogao Caves site, Ma said. Moreover, before the caves were built, Dunhuang had provided fertile soil for the development of Buddhist culture. It is documented that in the Western Jin Dynasty (265-317), Dharmaraksa, who was later known as the “Dunhuang Bodhisattva,” translated Buddhist scriptures together with his disciples. In the 20th century, Wang Chongmin, an expert in Dunhuang studies, copied A Journey to the Mogao Caves from a Dunhuang manuscript that has been kept in a French library. According to the accounts, Western-Jin calligrapher Suo Jing did wall inscriptions at the Xianyan Monastery. Ma has researched Suo Jing’s Xianyan Monastery trip since the 1980s in the hopes of discovering clues about the ancient monastery’s location. A second Dunhuang manuscript, which is numbered P.t.993, offered some evidence. The P.t.993 manuscript is a realistic landscape painting that depicts a monastery-like building complex encircled by pagodas and trees in a valley. After investigating the Mogao Caves and the surroundings dozens of times, Ma speculated that the present-day Chengchengwan site in the Dangquan River valley should be the Xianyan Monastery portrayed in the Dunhuang manuscripts. The temple was built some time earlier than the Mogao Caves, he said. The Mogao Caves, also known as the Thousand Buddha Grottoes, is 25 kilometers southeast of downtown Dunhuang, an oasis at a religious and cultural crossroads on the Silk Road in Northwest China’s Gansu Province. Housing the world’s largest collection of Buddhist art, it was listed as a UNESCO World Heritage Site in 1987.